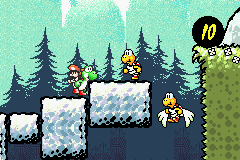 Visit Koopa And Para-Koopa is the first level of World 2 in the game Super Mario World 2: Yoshi's Island and its remake, Yoshi's Island: Super Mario Advance 3. Besides a new scenery, the level introduces Poochy to the main levels, and several new enemies, such as Koopa Troopas and Para-Koopas, and also introduces new obstacles, such as Falling Rocks. It's also the first level in which Baby Mario can turn into Superstar Mario. It also introduces Baron von Zeppelins as harmful enemies, instead of the always-helpful Barons of World 1. The player starts off on a grassy platform with some floating rocks nearby. On the rocks are Koopa Troopas and a Para-Koopa. After these floating rocks is another grassy platform with a Warp Pipe next to it. If the player goes down the Warp Pipe, they will be an area with a Super Star that will transform Baby Mario into Superstar Mario and will allow him to collect the coins and Flower in the area. To the right of the Warp Pipe are more floating rocks, some of which begin to fall after being landed on, and a platform that contains a Warp Pipe. The Warp Pipe leads to an area with another Warp Pipe right next to it, which leads to the next area. Poochy can also be found on the area, where if used he will go across some Spikes and go to a Crate that contains a Key. The next area is very small and only contains the Middle Ring and a spring ball that leads to the next area. In the next area, the screen will autoscroll upwards whilst Yoshi must dodge falling rocks that can easily crush him, at the end of this section is a Flower. After this section are some more floating rocks with an Eggo-Dil on the middle one. The rocks at the side fall when stood on and lead to some Red Coins. After this, there is another Eggo-Dil. If Yoshi shoots an egg upward towards the wall on the raised platform before the Eggo-Dil, a Winged Cloud is revealed containing a ! Switch. Hitting the switch opens a path underneath the Eggo-Dil that leads to a secret, underground room with multiple 1-Ups. After the Eggo-Dil are some small platforms that have Baron von Zeppelins dropping bombs or Shy-Guys down onto them. After this section is another section that has falling rocks, and then a section that contains floating rocks. When the player reaches the end of this section there will be a Door which leads to a minigame and the goal roulette. First, touch the Super Star to turn into Superstar Mario! Hold Right or Left on the Control Pad and you can run up walls and even across ceilings!! Hold to float! Hold to dash! This dog's name is Poochy. He's pretty cute, huh? Hitch a ride! He runs in the direction that Yoshi faces. Yoshi in a falling rocks section. Superstar Mario running up a wall. French Revoilà nos Fameux Koopas!! Our Famous Koopas are Back!! This level is similar to Rock 'n' Fall from Yoshi's Island DS and to Koopa Canyon from Yoshi's New Island. This page was last edited on April 6, 2019, at 18:48.